Enterprise architecture (EA) is a set of descriptions relevant to both business and IT intended to bridge the communication gap between business and IT stakeholders in organizations, facilitate information systems planning and improve business and IT alignment. Due to complex historical reasons, the notion of enterprise architecture was always surrounded by endless speculations, dangerous myths, non-existing best practices, unfulfilled promises, expensive failures and grave disappointments. Traditionally the entire discourse around enterprise architecture was dominated by shallow advice and faddish approaches, e.g. well-known EA frameworks, infinitely distant from the practical realities, but nonetheless aggressively promoted by commercially motivated consultancies and gurus. At the same time, realistic and trustworthy information on enterprise architecture is still incredibly hard to find in any available sources. 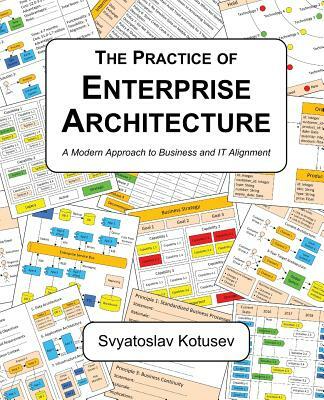 What is the meaning of enterprise architecture and an EA practice? What processes constitute established EA practices and how do they work? What EA artifacts are used in successful EA practices and how? What is the best way to structure architecture roles and functions? What software tools and modeling languages are necessary for enterprise architecture? How to initiate an EA practice in organizations from scratch and evolve it? Where do current EA best practices originate from? This book is organized in a highly structured, sequential manner and does not require any prior knowledge of enterprise architecture. The book is intended for a broad audience of people interested in enterprise architecture including practicing and aspiring architects, architecture managers, academic EA researchers, EA lecturers and students in universities.